Secrets of Digital Animation — August 2009! 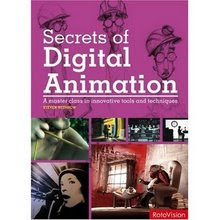 Now available for preorder through Amazon.com and other online bookstores is my book Secrets of Digital Animation from RotoVision and Rockport Publishers. Secrets of Digital Animation sets out to demonstrate and showcase a range of cutting-edge work, new techniques, and influential practitioners within all forms of contemporary animation, from anime to flashware, and from animated shorts to machinima, offering creative hints and tips from the genre masters. This book offers young practitioners, and those interested in broadening their skills, an insider’s view of the fast evolving work of animation; showcasing professionals and their creations, working methods, and inspiration, along with jargon-busting explanations and easy to follow demonstrations. Stunning examples of finished work are shown alongside conceptual drawings and works in progress. The book contains practical advice and case studies that explore the professional techniques behind designing innovative characters and fantastical worlds, and bringing them to life. Next Next post: New Simpleton in which Lives are Lived!